Blackface and lynching images from North Carolina Democrat Roy Cooper’s yearbook have emerged just days after he called on Virginia Governor Ralph Northam to resign over racist images in his yearbook. 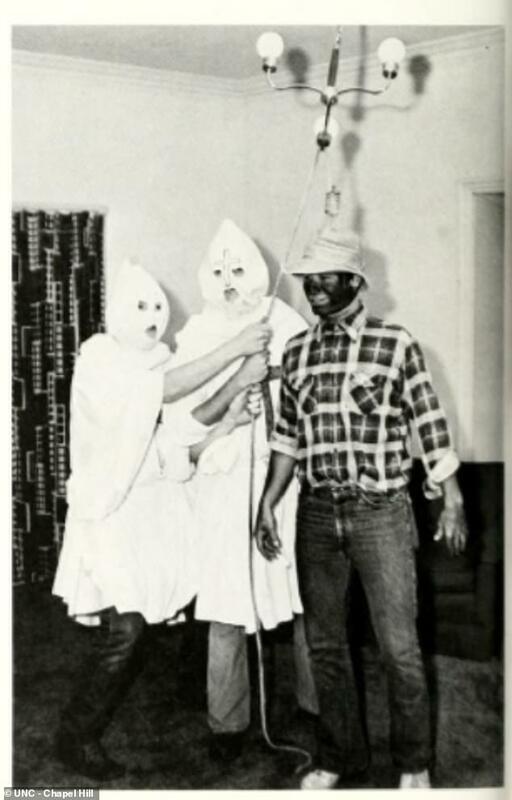 The pictures surfaced Wednesday showing what’s believed to be two members of the University of North Carolina Chapel Hill’s Chi Phi fraternity donning white robes, similar to those worn by the Ku Klux Klan, and depicting a lynching with a man donning blackface. Aside from the shot where they use a lighting fixture with a noose, the two-page spread for the frat shows a woman kissing a man’s cheek and they too have their faces blacked up in the black-and-white pictures. Images from the University of North Carolina Chapel Hill’s Chi Phi fraternity 1979 yearbook. And who can be surprised at pictures of Democrats lynching people? That’s who they are and that is what they do.